by David Kreutzer: Hurricane Matthew is big, dangerous, and (if it makes landfall) something not seen in the continental United States for a decade. This, of course, means it will be linked to global warming. There will be a lot of “scientists say we can expect,” but little actual data. 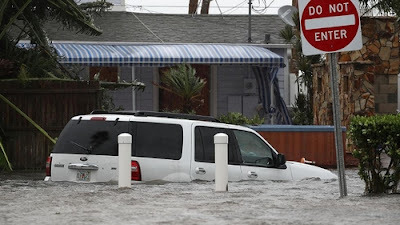 That’s because the data show for the last 10 years we have had an unusual drought of landfalling major hurricanes (Category 3 and higher) on the continental U.S. That’s right, no major hurricanes have made landfall for over a decade. This is the longest such drought on record. A lot of it is luck. 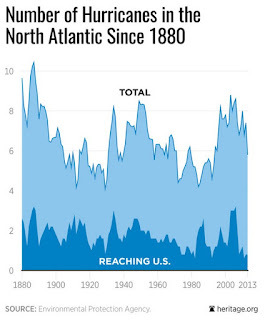 There have been major hurricanes in the Atlantic whose paths have not taken them onshore. However, there has not been the steady increase in hurricane activity that the doom-and-gloomers predicted following a swarm of major hurricanes in 2005. Yes, there is a lot of change from year to year, but there is no worrisome trend. In fact, taking a tally of the scariest hurricanes (Categories 4 and 5) indicates things were worse nearly a century ago. For the 44 years from 1926 to 1969, 14 of these most powerful storms made landfall, while the 46 years since then had only three. Good luck will almost certainly run out and we will have years with multiple major hurricanes making landfall. If so, that is a return to normalcy, not a harbinger of impending climate doom. 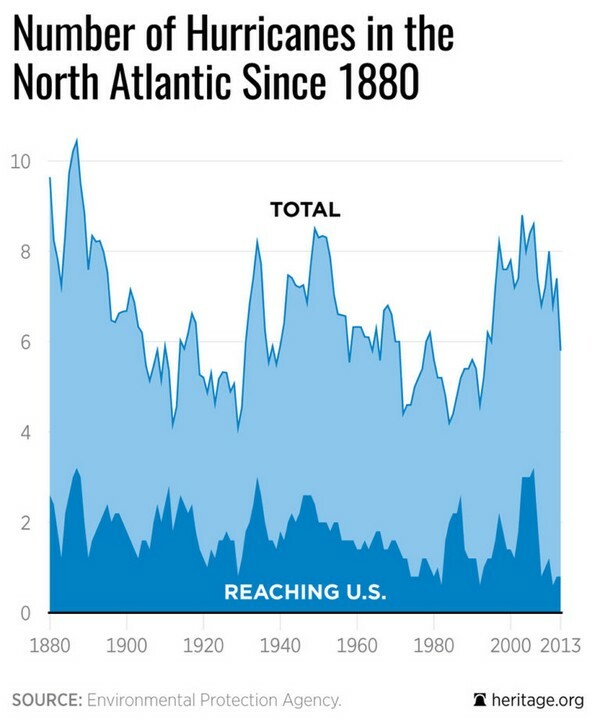 Since record-keeping began in the 1800s, the average annual landfall of major hurricanes is about two. However, it is far from constant as recent experience shows. Further, a return to normalcy very likely will be associated with record levels of financial losses. This is due to the explosion of coastal development of recent decades. Again, it will not be due, as some will assert, to more frequent or more intense hurricanes. The last decade has been a very mild one regarding major hurricanes hitting American shores. If Hurricane Matthew makes its expected landfall in the U.S. this week, the drought will be broken, but it won’t be a sign that we are headed to a man-made climate catastrophe. David Kreutzer (@dwkreutzer) is the senior research fellow in energy economics and climate change at The Heritage Foundation's Center for Data Analysis. In this position, Kreutzer researches how energy and climate change legislation will affect economic activity at the national, local, and industry levels. Tags: Linking, Hurricane Matthew, Climate Change, Is Overblown Hype, David Kreutzer, The Daily Signal To share or post to your site, click on "Post Link". Please mention / link to the ARRA News Service. and "Like" Facebook Page - Thanks! Using the lives of people and their properties for political purpose sick sick sick.